The difference between Red Snapper, Lane Snapper and Yellowtail Snapper? How to prep Passion Fruit? How to make Peach Melba? 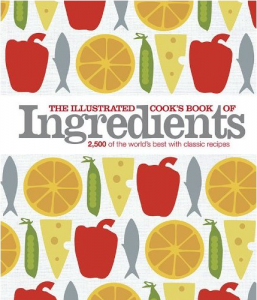 The Illustrated Cook’s Book of Ingredients provides info on most of the foods you’ve heard of, and with 2,500 ingredients, there are probably at least 1,000 that you haven’t. Each ingredient has a picture, background info and how to buy, store, eat and pair with other food. It’s the perfect go-to book for new foods, new techniques and new ideas.